Do you produce brochures or have a showroom? We no longer produce brochures for our products, we display all products on our website and we do not have a physical shop or showroom - just offices and the warehouse which are not open for public access. Currently No - at this time we are not able to offer any made to measure service as the GE Little Group is under new management and the made to measure service is not part of it yet - it is something that we are hoping to do in the near future but we are unable to give a specif timeline as yet. Please check back for further updates . From where do you source your timber products? We are aware that we are using a natural resource when producing wood products. We are careful to ensure that all timber products used are harvested from sustainable and managed forests. This includes our MDF (wood pulp) for the real wood veneers used in producing the radiator covers and the Veneered MDF grilles. We accept all major credit and debit cards for payment of internet orders which are processed via PayPal Pro, you can also pay via your Paypal account. Please DO NOT EVER put any Credit/debit card details in an email to us us this is not a secure transmission system. Payment is always taken in full at the time of ordering for all orders. You can also print your order and post it to us and pay by cheque. However, we regret that no products will be dispatched until we have received and cleared your payment (approx 5 working days) as payment in advance is required to process all orders. How do I assemble my cabinet & access my radiator valves once the radiator cover is fitted? All our ready made covers come with complete fixing instructions. Assembly of most covers only takes a few minutes. Our ready made designs use wooden "wall block" fixings and once these are fitted to the wall, removal and repositioning, of the whole cover for access takes just seconds. In this way the whole cover surround can be taken off very easily for full access by just lifting the cabinet off the hook screws and pulling forward. 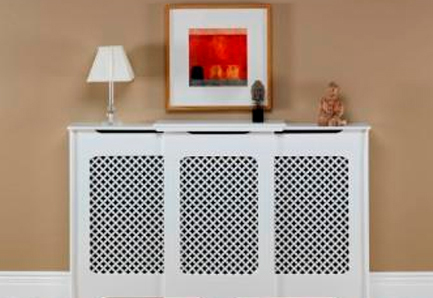 Can radiator covers be fitted over electric storage heaters or gas/electric fires or boilers etc? All our cabinets are designed for use only with standard wet radiators (running at the standard temperature range of 65-70 degrees) and are not suitable for covering electric storage heaters or any other heat source such as fires etc or any other heat source running in excess of 65-70 degrees. None of our cabinets are painted with finishes that can be guaranteed not to yellow under such heat extremes Anyone who wishes to cover a disused gas fire or boiler etc should cosult a GasSafe (formerly CORGI registered) plumber/engineer to ascertain whether or not this would be safe. Does adding a radiator cover obstruct heat flow? In our experience MDF covers do not create any additional heat loss/output problems as MDF is very stable and does not absorb heat. The heat is pushed out in to the room (rather than just going straight up from the radiator). You will see that all designs have a large bottom vent (inlet) and another slightly smaller top vent (outlet) - this means that the cool air is pulled in through the bottom and convected up and out the top. As we do not restrict this convection process in the designs the heat output is maintained. In addition to the top and bottom vent all our grille options have approx 25-50% free airflow (more detailed info under "important info" on the decorative grilles ordering page). The same principle applies to the covering of thermostatic valves. Most customers choose to cover their valves with their radiator cover rather than leaving them exposed. As above, as the air is drawn in at the foot of the radiator cover, the cooler air by-passes the valve in much the same way as it would were it not covered hence the thermostatic function is not affected. Do you allow for extra "panels" as appropriate for the length of cover I'm ordering? The machine that manufactures the cover has macros that automatically calculate how many "panels" your cover will need to keep its perspective correct. On the Classic designs, this means, you will have the correct number of square or arch "panels" automatically cut to maintain the correct look. How accurate is the cutting process for measurements provided for the ready made covers? The sizes detailed for ready made covers have a 5mm margin of error. Do the grilles come fitted? 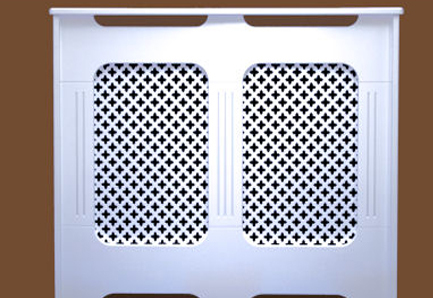 Yes - all covers that require a grille will come with the ordered grille pre-fitted. We fit anodised grilles after painting or lacquer coating, and MDF grilles are fitted prior to painting or finishing so they match the cover surround. Unfortunately, MDF will often warp slightly when exposed to dampness (this can sometimes be due to being exposed to damp air in transit) - it is not the actual dampness that causes this but the uneven drying out i.e. one side drying out quicker than the other and is often more frequently noticed during the damper/colder months when cabinets are subject to more extremes of temperature before assembly (moving from the carrier's warehouse and lorries into centrally heated homes). It is for this reason that we always prime both front and rear sides of our cabinets whilst finishing them as this ensures more even drying and therefore eliminates warping during finishing. This warping is only temporary and will always straighten out once they have completely dried out or once the cabinet is assembled as the fittings pull the parts into place and ensure that the rigidity of the cabinet is maintained and prevents warping being possible. How do the covers fit to the wall? Please ensure your cabinet is kept in dry conditions prior to assembly as exposure to damp will result in a slight swelling of the MDF fibres and may render it difficult to assemble your cabinet as the need to fit into tight slots and rebates that are machined to be tight so any swelling may make this difficult or impossible. After the cover has been assembled - they are easily fitted to the wall by "wooden block" fixings. Place the cover against the wall. Mark through onto the wall where the rebated grooves are in the underside of the top lid. Take the cover away, drill the holes and, using suitable fixings (standard fixings supplied - alternative fixings may be required e.g. for stud walls), afix the "block" style fixings to the wall. Your cover will now "hook" over these blocks. The cover weight is actually taken by the floor, the fixings are designed to stop the cover from tipping forward for safety and to stop it from moving from side to side. The cover can be easily "unhooked" from the wall as and when required. The Elan range utilises standard mirror plates for fixing to the wall. I want a ready made cover but you are only offering plain/primed and I want primed/painted - can you finish ready made covers? No, many of our ready made ranges are imported and therfore these come into us pre-packaged so we are unable to offer any sort of finishing services for these covers. How do I finish my cabinet and will you paint my cabinet in my choice of colour? For plain MDF cabinets we would recommend that you gently sand rough edges using fine grade sandpaper. Remove any dust with a soft damp cloth. Then coat with primer and sand again before applying your chosen colour. For primed cabinets we would recommend that you gently sand rough edges using fine grade sandpaper. Remove any dust with a soft damp cloth before applying your chosen colour. As with all woodwork, it is strongly recommended that you wear a mask and work in a well-ventilated area. We also recommend priming and painting the cabinet before assembly for ease of painting - the grilled front panel is best painted by placing this on newspaper (or other protected flat surface) on the floor and painting/priming utilising a roller. Care should be taken when priming/painting the grille panels as these are decorative grilles (3mm thick on imported covers and 4mm on UK made covers) with approx 50% airflow and therefore quite delicate so care should be exercised to ensure that not too much pressure is applied. Any paint is suitable for finishing but we would recommend an oil based paint to ensure the finish is waterproof and relatively easy to clean. You are likely to need to apply a minimum of one coat of primer and two coats of top coat but much depends on the shade, quality and thickness of paint applied and the amount of preparation. Unfinished oak veneer cabinets will require a light sanding before they are ready to be either stained and/or varnished or lacquered as required. The veneer on the rear of the grille panels may also require a light sanding as the low grade veneer utilised on the rear of these panels (added for machining purposes only) may flake or chip but this will not be visible from the front of the cabinet but you may wish to remove any loose flakes from the rear prior to finishing (please see manufacturing information for more detail). Only the unfinished oak veneer cabinets are suitable for staining/varnishing/lacquering to your requirements as these are the unfinished cabinets with a wood grain. We are unable to paint our cabinets to any other finishes other than those detailed on our ordering pages i.e. primed, white, barley white or one of the wood veneer finishes. I want a large number of cabinets, can you provide a discount? Quantity Discounts: All Ready Made cabinets are already either clearance lines that are very heavily discounted or are standard lines that we stock or manufacture and we endeavour to always keep prices as keen as we are able, even with our own manufactured covers that we manage to keep priced to compete favourably on price with cheaper imported cabinets. As we also heavily subsidise delivery costs (see below) we are unable to provide any further discounts unless your order is for more than 10 covers in which case please contact us in advance of ordering but please note that no further discounts are available on any clearance or special offer lines or any of the UK manufactured cabinets. Made to measure cabinets are obviously individually made bespoke items and therefore no discounts are available for multiple orders. Delivery Discounts: We are unable to provide delivery discounts on rad covers. Radiator covers are very large and heavy items (ranging from 1-3m in length and 11kg to 55 kg in weight each) and this is reflected in the carrier charges for delivery. Covers are sent via carrier and cost us £10-£35 + Vat each with no discount for subsequent parcels + currently there is also a £2 per parcel fuel surcharge and in addition we are also charged £10 + VAT for each attempted and failed delivery. As you will see, we therefore already heavily subsidise the delivery costs for our items. In the event that you wish to purchase more than 6 covers then we may be able to arrange a discounted palletised delivery so please contact us for a quote for this but please note that the starting rate for palletised delivery is £65 + Vat cost to us and many cabinets require two pallet spaces because of length (anything over 1200mm length).